I know I wasn’t the only kid who was obsessed with ancient Egypt. Mummification, awesome gods, and pharaohs, what wasn’t to love? 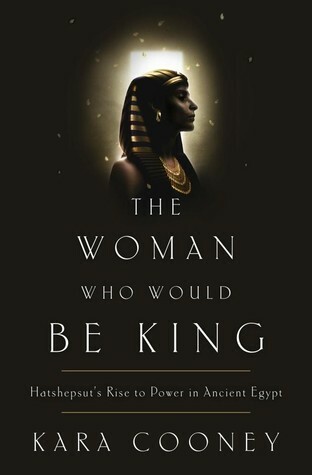 So, the offer to read The Woman Who Would Be King, the story of Hatshepsut, felt like a no-brainer. I had high hopes going in. The author, Kara Cooney, is a professor at UCLA. She teaches Egyptian art and architecture. She’s also consulted for Discovery Channel. I was a bit surprised, however, at the extent of research she put into a book primarily aimed at laypersons. The notes and citations is near 50 pages long. It was a bit mind boggling to see, pleasantly so. The story begins before Hatshepsut was conceived, with her father’s rise to power. In doing this, Cooney is able to construct the context in which Hatshepsut grows up and the politics she deals with. Cooney continues throughout Hatshepsut’s acquisition of power, and, finally, ending with the near systematic eradication of Hatshepsut from the historical record. One of the best parts of this book was the way that Cooney fills in the missing parts of the story. Much of the personal lives of Egyptian royalty was not recorded. Personal matters weren’t taken down in official records, leaving much of the relationships and day-to-day lives of leaders a mystery. To Cooney’s credit, she never attempts to state that Hatshepsut or any other player’s life was certainly one way. She presents a case for the person’s life, providing alternative explanations and arguments. While her arguments may be strong, it lends a lot of credibility to see why she believes that Hatshepsut’s life was a certain way or other. The story is extremely thorough and very complex. Thoughts about Hatshepsut are often overly simplistic. People present her as a woman who rose to power through ambition alone. Cooney shows that the story is actually much more complicated. There were religious and political considerations that led to her gaining and keeping power. She shows Hatshepsut as a woman motivated by family concerns, a deep-seated piety, and concern for her country. As a result, the story is believable and infinitely more realistic than more simplistic versions. Cooney doesn’t shy away from the discussion of gender and sexuality. While little is actually known about Hatshepsut’s sexuality or sexual life, gender was clearly a concern throughout her reign. She was a female king in a patriarchal society. Records of her life show the transition from wife to regent to king as a complicated dance wherein Hatshepsut had to balance the political, societal, and religious understanding of gender and sexuality, ideas which are very different from our own. Cooney shows this with a great deal of nuance and provides the broader cultural context for a reader to understand the shift. Overall, I was very impressed with Cooney’s story. It’s very readable without sacrificing understanding or content. She doesn’t pretend the story is anything other than what it is, but, at the same time, she gives a nuanced explanation for what may have happened during Hatshepsut’s life and rule. I received a copy of The Woman Who Would Be King for free from the publisher in exchange for an honest review. This entry was posted in Reviews and tagged Amen Re, Amun Ra, Ancient Egypt, Biography, Egypt, Hatshepsut, Kara Cooney, nonfiction, Pharaoh.